This is a very inspirational post written by Dr Himanshu Gupta and was posted on his page at this link. We have all faced a similar struggle to retain and perform in exams but have never been this eloquent and straightforward to put our struggle in words to inspire many. Great job Dr Himanshu Gupta! Hope his words motivate you all to get your dream PG/ Superspeciality Seat. P. S. :- A Picture of a place where I studied and lived ! "I want to share a small story of mine. We live in a world where everyone hides what they do and how they do things. People fear if they let out their secrets to someone the other person will become better. Yes survival is important but at the same if you just let out the true stories, it can inspire others and make lives better. From a rank of 54000 in neet last year I reached a rank of 62 this year. I was a failure in my mbbs, I had a supple in pharmacology and was the lowest scorer in my final year exams. I still remember that day when I got supple, people make you feel like you have murdered someone. Throughout my mbbs I have struggled to pass the exams and to give answers in the viva and have been humiliated in the viva's of various Professional Exams and I had problems learning or retaining anything. I was practically zero till the end of final year. I had been looked down upon by people because I was unsuccessful. I started believing that maybe I have come in the wrong place. But I had no other choices in life and neither I wanted to take bigger risks to do something else and somehow I completed my mbbs on time which is no less a thing for me. So it was the drop year, in the month of January I check my result my Rank 54000. Shocked I was, ashamed of myself and for letting my family down and I couldn't even tell my rank to anybody and even lied it was around 12000 to save my honour(people judge by numbers and ranks). I had no options in life except to get a PG. After my mbbs I had lost faith in myself and wondered can I even do this thing. But I kept all my worries aside. I started reading some motivational books. I spent half an hour daily to motivate myself, to stay positive and I watched motivational videos and read 2-3 pages from a motivational book. Every day my routine would start with that and I kept a hope alive in me , " I can do it and I will go to aiims ". I was not used to studying in the internship and so I when I started it was quite a difficult thing for me. I started from studying 4 hours a day then gradually increased to 10 hours a day. In the early days people used to laugh at me to see a book in my hand and say Tu padta bhi hai?. These words touched my heart, and when people for whom I spent my time said these things, I knew I had to do something no matter what it takes. I had this fear of not remembering anything, when I used to think about vivas where I always stayed blank. I knew if I repeated that thing again, I was out of the competition. I had once shared my problem to someone about not remembering anything, he was preparing for DM cardiology. He told me that he was AIIMS rank 2 in the aiims cardiology exam and he also doesn't remember anything. Then he asked me, "what do you think how many times I must have read this textbook of cardiology?" I said 5 times. He replied to me, "I have read every chapter 20 times and that's how I remember things!". So I knew I had to do that thing in my drop year, I started to develop this habit of revising things. Initially it was very hard, it's easy to read new things for the first time but when you had to read that thing second time you cry from inside. I used to re read multiple times with gaps which were of short time period. I started to paste important things and tables on Wall, I remember the first thing I pasted was GCS which I had not been able to learn all my mbbs and I would read all the things I pasted on Wall daily. And with time I started to gain confidence. I finished my syllabus along with T and D. But because I used to revise very frequently I finished my syllabus thrice along with t and d which finished in the end of August. I never waited to complete my whole syllabus and then start revision. Revision changed me, I started to retain things and I used to feel surprise about myself when I started answering question when discussing with friends. I started giving grand test from the beginning and my score was constantly improving. In the mid year dnb, I got 1700 when I felt like I was on the right track, at that I had not even touched medicine or surgery. My final year was very weak, and I attended coaching for medicine by Deepak Marwah Sir and surgery by Pritesh sir. I also attended path class by Devesh sir. Then I attended Dvt And Sumer Sethi sir told everyone if you want to increase your speed target CBT. I set my next target as cbt and completed my whole syllabus again before cbt and got 150 rank which boosted me a lot. It was the first time in my entire mbbs I had a great score. Then I had become very fast by that time, when I used to take 10 days to complete one subject I started completing whole syllabus in 10 days. Though I was weak in catching the minute details from the notes but because of the speed I had a superficial knowledge of all the subjects at one particular time. By september end I was good with notes but mcq books theory I had not revised much because everyone asked me to focus just on notes. So I had reached a steady state in grand tests, 180 to 195 questions, when I realised I had to cover more of content from the mcq books. Some books I had done very well but few subjects whose mcq books I had not done properly in those subjects my marks were coming around 40 to 50 percent. 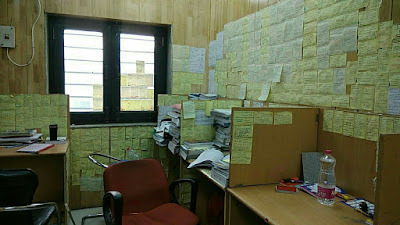 23 days before aiims exam I revised almost all that I had done, and focused on weaker portions as well. I was able to revise notes and text from mcq books but I could not revise mcqs. And I was confident for aiims exam. Then the aiims result came it was 1100. I was shocked because I had always studied with that aim in my mind. Yes my paper also didn't go that well because somehow I felt there were many things I didn't know. Then it was PGI again the same story didn't do well - 460 rank. I had always developed that mental strength in me no matter how bad things may go I won't give up. In AIIMS and PGI I was little anxious before the exam, it was only because of knowledge I won't blame it on getting anxious that I didnt make it there. But I decided that the Neet pg I will give in a relaxed state. And I was confident after two cycle of revision and mcq practice that I will get a pg seat even if I perform the same as I had done in AIIMS. One thing that helped me was that I did not miss a single DAY, not even a single, on studying from February till the neet exam on studying. Even if there was aiims exam or pgi exam in May or CBT I would immediately start studying irrespective of it ! I want to thank my parents, my friends and my teachers entire dams family, Sumer Sethi sir, Deepti Mam, Devesh mishra sir , deepak Marwah Sir, Pritesh singh sir, Utsav bansal sir, Sumit Kumar Sir and Gaurav Khatana sir for supporting me, teaching me and having faith in throughout my preparation! TAKE UP ONE IDEA, MAKE THAT ONE IDEA YOUR LIFE THINK OF IT DREAM OF IT LIVE ON THAT IDEA. LET EVERY PART OF BODY BE FULL OF THAT IDEA. THIS IS THE WAY TO SUCCESS.